Last Monday we organized another in-house day for TIAS students. TIAS Business Tour aims to offer the opportunity for passionate fellow master students to learn from innovative companies, feel challenged and valued during the day, then return home feeling inspired, confident and clear about their future career aspirations. 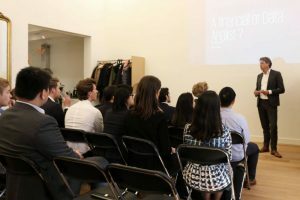 The responsible for this event was Gwen van Driel and together with Young Financials, they have prepared a schedule that even included a guest speaker from one of the Big Four consulting firms. Young Financials is a company that has been connecting young financial talents with job positions in the Dutch financial sector for more than 11 years. They have recently developed a new label called Young Analytics. 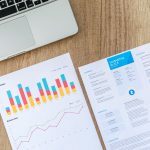 The idea behind it stems from the changing demands placed on finance professionals and the increasing demand for data analysts in the financial sector. Michel Maaswinkel started off the night by welcoming us and introducing the guest speaker. We were told about current trends within the Dutch job market and the intersection between finance and analytics. The last module from Business Analytics specialization has been delivered by IBM, thus a good source to cite for those who are interested to read more about this topic: “Analytics: The real-world use of big data in financial services”. On behalf of TBT, I would like to say thank you for the Young Financials team responsible for organizing this event: Michel Maaswinkel, Laurens Jagt, Benjamin van Beek, Floor van Ligten, Geert van der Rijdt, and Sanne Frowijn. Inspired by that night, I decided to take this discussion to the next level. As you may or may not know, we are living the “Fourth Industrial Revolution”, where the world’s most valuable resource is no longer oil, but data. This has implications for all industries, not only financial. Recently, I have been giving various tips and tricks to close friends about this whole new world. Then I remember that once a friend told me that “sharing is caring”. Thus, based on the knowledge acquired throughout my Business Analytics specialization at TIAS School of Business and Society, combined with my personal proactiveness (must admit, even if it sounds cliché), I would like to share a few random references for those who might be interested in learning about this field. The future is here and everyone who is currently reading about it is already one step ahead! Data Incubator (! ): The Data Incubator is a data science training organization. They run a free advanced 8-week fellowship (think data science bootcamp) for both Masters and PhDs looking to enter industry. I am a semifinalist! Data Science in 30 minutes: Learn how to build a data-science project in various free Data Science in 30 minutes webcast! Big Data University: IBM’s free online learning with over 400,000 students. Quora: Quora is a place to gain and share knowledge. 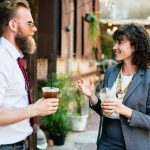 It’s a platform to ask questions and connect with people who contribute unique insights and quality answers. Stackoverflow: Stack Overflow is the largest online community for programmers to learn, share their knowledge, and advance their careers. Tableau: Tableau can help anyone see and understand their data. Connect to almost any database, drag and drop to create visualizations, and share with a click. Canva: Canva makes design simple for everyone. Create designs for Web or print: blog graphics, presentations, Facebook covers, flyers, posters, invitations and so on. (They have free template as well as paid ones). Rapidminer: RapidMiner makes data science teams more productive through a unified platform for data prep, machine learning, and model deployment. Knime: is an open source data analytics, reporting and integration platform. KNIME integrates various components for machine learning and data mining through its modular data pipelining concept. A graphical user interface allows assembly of nodes for data preprocessing (ETL), for modeling and data analysis and visualization. IBM Bluemix (! ): The Bluemix cloud platform is not just about creating new apps or migrating existing ones, on-prem or off-prem implementations, or offering IaaS and PaaS cloud services. It’s designed to bring all of these aspects together to help you solve your real, complex business problems in the cloud. There are various tutorials available online. It is fantastic! EDX: Free courses in computer science, engineering, history, psychology, nutrition, big data, statistics and hundreds more. Coursera: 2000+ courses from schools like Stanford and Yale – no application required. Build career skills in data science, computer science, business, and more. DataCamp: Learn Data Science from the comfort of your browser, at your own pace with DataCamp’s video tutorials & coding challenges on R, Python, Statistics. Qlik: Qlik is a software company provider of QlikView and Qlik Sense, business intelligence & visualization software. IBM Cognos: IBM Cognos Business Intelligence is a web-based, integrated business intelligence suite by IBM. It provides a toolset for reporting, analysis, scorecarding, and monitoring of events and metrics. Apache Hadoop: is an open-source software framework used for distributed storage and processing of big data sets using the MapReduce programming model. It consists of computer clusters built from commodity hardware. GDPR (General Data Protection Regulation): The General Data Protection Regulation (GDPR) (Regulation (EU) 2016/679) is a regulation by which the European Parliament, the Council of the European Union and the European Commission intend to strengthen and unify data protection for all individuals within the European Union (EU). Microsoft Azure: Microsoft Azure is a growing collection of integrated cloud services that developers and IT professionals use to build, deploy, and manage applications through our global network of datacenters. KDnuggets: is a leading site on Business Analytics, Big Data, Data Mining, Data Science, and Machine Learning. Kaggle: Runs programming contests to crowdsource machine learning solutions. Offers forums, a database of public datasets, tutorials, and so on. Solver (Excel): Image result for solver excel definitionwww.solver.com Solver is a Microsoft Excel add-in program you can use for what-if analysis. Use Solver to find an optimal (maximum or minimum) value for a formula in one cell — called the objective cell — subject to constraints, or limits, on the values of other formula cells on a worksheet. Github: where developers can store their projects and network with likeminded people. Heroku: Heroku is a platform as a service (PaaS) that enables developers to build, run, and operate applications entirely in the cloud. – Who controls the world?